This chapter provides an overview of the central theme in this volume: the relevance of social capital for health and well-being within various contexts or environments. The ongoing greying of populations is today a worldwide challenge. To keep older people active and healthy is a key policy objective as well as a topic highlighted in research. 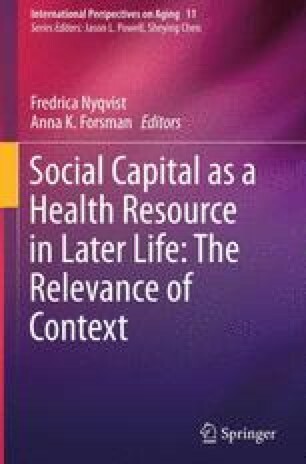 Active and healthy ageing is highly influenced by the social environment in which an older person lives, and a research focus on social capital offers a way for understanding the relevance of the social environment on the micro (individual), meso (neighbourhood) and macro (societal) level. Social capital is a resource that can be used to promote health and well-being; yet research has thus far largely ignored the relevance of social capital for older people. This chapter addresses the central social capital themes of this book by describing three different contextual views of social capital: the individual, neighbourhood and societal contexts. FUTURAGE. (2011). A Road Map for European Ageing Research. http://futurage.group.shef.ac.uk/roadmap.html. Accessed 26 May 2014. United Nations, Department of Economic and Social Affairs, Population Division. (2013). World Population Prospects: The 2012 Revision, Volume I: Comprehensive Tables ST/ESA/SER.A/336. http://esa.un.org/unpd/wpp/Documentation/pdf/WPP2012_Volume-I_Comprehensive-Tables.pdf. Accessed 26 May 2014. World Health Organization. (2002). Active ageing: A policy framework. http://whqlibdoc.who.int/hq/2002/WHO_NMH_NPH_02.8.pdf. Accessed 12 May 2014.